The Perspectivity Fest is coming up! Join us on the 3rd of November at Blue City Rotterdam. You are invited to join us for a day filled with inspiration for transformation. 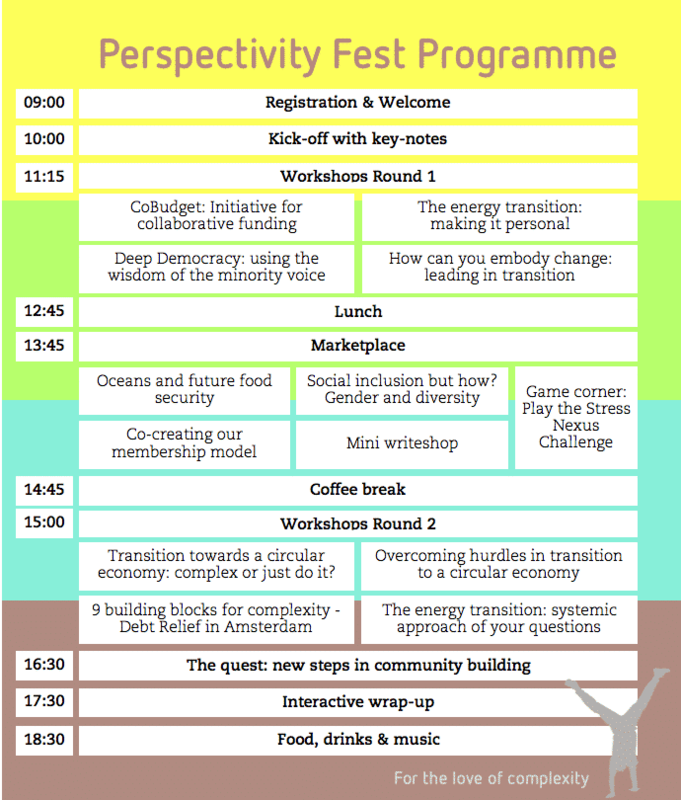 A full day of thought provoking workshops, a marketplace of inspiring questions and stories, a game corner, loads of interaction and food, drinks & music to celebrate the day. Together we will explore how we can navigate complexity in times of transition. We will focus on three themes of transition: moving towards a circular economy, renewable energy and an inclusive society. 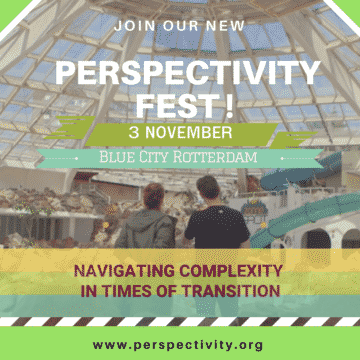 The Perspectivity Fest is our new, annual event! An encounter to deepen your network, exchange experiences and share lessons learned. A place to see, hear and feel the impact and range of the work that has been done. A time to tap into the wealth of knowledge and explore big questions together. A day that will ignite your ambitions and your dreams. Or maybe a breath of inspiration to start something new. Get your tickets now! Follow this link to order them. Whether you know us thoroughly, or just heard of Perspectivity. Whether you are employed or independent. Whether you work for a government, a business or an NGO. Small, big, or in between. We welcome all creative minds, connectors and innovative go-getters to be part of the community. A community of professionals passionate about exploring how to navigate in these times of transition. We are excited to host this event and look forward to meeting with you on November 3 in Blue City.